Cryptojacking is on the rise — How is your organization's cloud security? Cryptojacking, the unauthorized use of a computer to mine cryptocurrencies, is on the rise and has put security teams on alert. 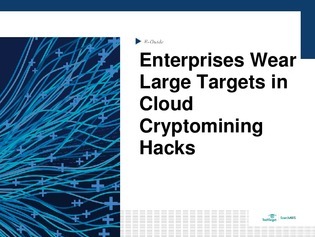 Recent targets for cryptojackers reveal how attackers gain access via unsecured resources. For example, Tesla had an internet-exposed Kubernetes console without password protection, which allowed an attacker to run cloud cryptomining scripts on Kubernetes instances. For this reason, enterprises are adjusting their strategies and applying dedicated approaches to cloud security and implementing disaster recovery procedures that reduce these ransomware attacks. Read on to find out how your enterprise can protect its data in the cloud, today.